Requires RATIO controls and DALI compatible devices. Supports up to 100 mA bus power. 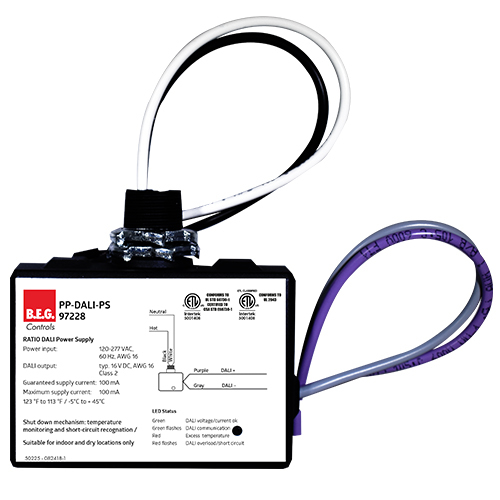 A second PP-DALI-PS can be wired in parallel to provide an additional 100 mA bus power (for 200 mA total). Do not connect more than two PP-DALI-PS, or a PP-DALI-PS with a different DALI bus power supply, to a single DALI bus. This could result in permanent damage to the connected RATIO and DALI devices. Mounts on a standard junction box through a ½ inch trade size knockout. Two lock nuts included.